Standing on the highest mountaintop, no devil or heretic [non-Buddhist sage] can approach him. 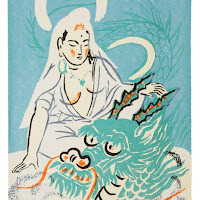 Descending to the farthest depths of the sea, he is not to be seen even by the Buddha's eyes. Even if your eye is like a shooting star and your spirit like one who catches lightning, you are still like the turtle, which cannot avoid dragging its tail. At such a juncture, what do you do? See the following. With splendid noses, each one is endowed with a powerful appearance. With firm, real footsteps, who needs to learn grandma Zen? Penetrate the activity of the ungraspable nose and you will see the method of the true adept. Tell me: Who is such a person? Liu Tiemo came to Guishan. Guishan said, "Old Cow, so you have come!" Tiemo said, "Tomorrow there is a great festival at Taishan. Will you be going?" Guishan lay down and stretched himself out. The imperial proclamation: the six kingdoms are at peace. An edict came down reporting the six nations cleared. In the quiet depths of the night, no one goes with him through the king's streets. In the depths of the night, who goes together walking the royal road? being serene, who's to pick at the details of strategy? Serene and gentle, who is willing to trouble to contend? bright moon and refreshing breeze enriching a lifetime. The bright moon and pure wind enrich a whole lifetime. "Iron Grinder Liu," she was called, and she was the leader of a congregation when she came to visit Zen master Zihu Heshang (780?-850?). Zihu said, "I've heard of 'Iron Grinder Liu.' They say you're not easy to contend with. Is that so?" Iron Grinder said, "Where did you hear that?" Iron Grinder said, "Don't fall down, Master." Guishan said, "After I die, I'll go down the mountain to an alms-giver's house and be a water buffalo. On my left flank five words will be written, saying 'A Guishan monk, me.' At that time, would it be right to call it a Guishan monk, or would it be right to call it a water buffalo?" The nun 'Iron Grindstone' Liu was like a stone-struck spark, like a lightening flash; hesitate and you lose your body and your life. This is a meeting of adepts: when pushed they move, when pressed they turn about. Iron Grindstone Liu had studied for a long time; her active edge was sharp and dangerous. Throughout the case Liu and Guishan seem to be conversing, but this is not Zen, neither is it Dao. Can it be understood by calling it unconcern? 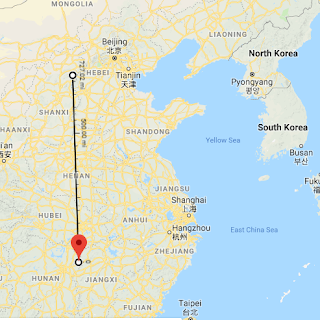 Guishan is over 800 km from Taishan; how then did Iron Grindstone Liu want to have Guishan go to the feast? What was her meaning? This old woman understands Guishan's conversation: fiber coming, thread going, one letting go, one gathering in; they answer back to each other like two mirrors reflecting each other, without any reflection image to be seen. Action to action, they complement each other; phrase to phrase, they accord. This old woman couldn't be fooled one little bit. If you can immerse yourself in this and penetrate through, you will see that Guishan and Iron Grindstone Liu acting in this way is the same sort as ordinary people's conversation. People are often hindered by the words -- that's why they don't understand. Only an intimate acquaintance can understand them thoroughly. Observe these two, Liu and Guishan. When letting go, both let go, and when gathering in, both gather in. In the Gui-Yang tradition, this is called "merging of perspectives." Guishan called himself a water buffalo and called Liu a cow: giving a name, an epithet of praise. In the meeting of Guishan and Liu, they didn't establish character or repute, didn't strive in danger and prejudice. The were relaxed and easygoing, seasoned and mature. This is a meeting of adepts, in which there are no more views of Buddha or opinions of Dharma. "You've come." When Guishan says this, there is no guest or host; they were like two mirrors reflecting each other, so that one could not tell them apart. This is the time of great peace. "Are you going?" They travel together; here there are no tracks. Liu's question is like the way a general remains heroic after peace is attained, asking returning soldiers if there is iniquity or clamor anywhere. Yet there is no more clamor. The battle lines have quietly been withdrawn. Guishan lay down -- as might be expected: the slow collapse of a great general. Since no one is coming or going, expediency is moot. No one knows the point of the meeting of Guishan and the Iron Grindstone. "Old cow, you've come!" There is an echo in the words. Of what? It's an echo of "going into action among different kinds." Tomorrow -- Are you going to the open feast on Five Peaks Mountain? 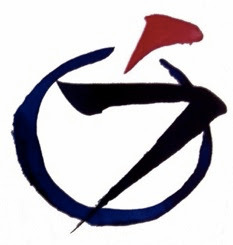 This is simply a meeting of adepts; it is not Zen, it is not Dao. It is unobstructed action, moving when poked, rolling when pressed. He lay down; she left. What realm is this? It is where "cats and cows know." The Iron Grindstone galloped in to Guishan's castle to win a battle, only to find all the land at peace. 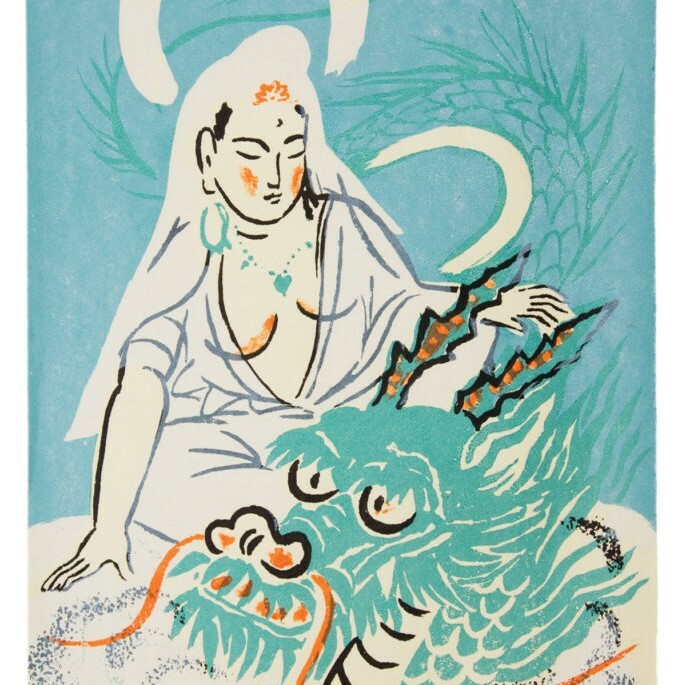 She called to Guishan to check if there was unrest anywhere, and Guishan, completely at peace, discerned none. She may have come just to have a chat with Guishan, but in the old days they were always ready for Dharma battle. Liu, especially, was a bomb that might explode at any time. "Old cow." An intimate greeting with a touch of humor. Taishan: A sacred mountain dedicated to Manjusri. Many learned and virtuous priests lived there, and there were many Buddhist temples, making it a place of Buddhist pilgrimage. 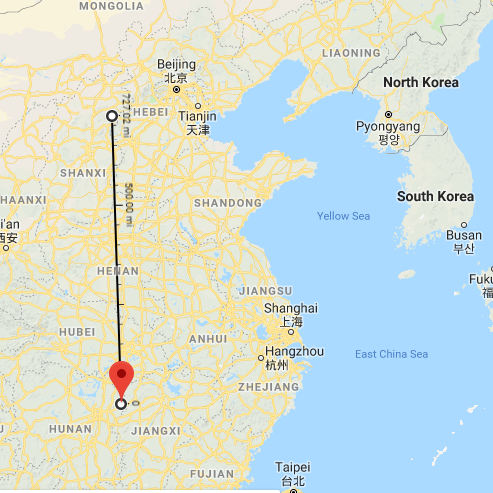 Taishan is in Shansi Province in North China, while Mount Gui is in Hunan Province, hundreds of miles away -- a journey of many days. Hence, "will you be going?" is a quite unreasonable question. Guishan lay down and stretched himself out. Peace reigns over Guishan's land. Liu then departed since she found it impossible to start a disturbance in Guishan's territory. "Old cow." The character in Chinese refers to a kind of water buffalo. That buffalo is your true self prior to thinking good and evil. (It's the ox in the ten ox-herding pictures.) It's a very intimate greeting, but there's also a touch of humor in it. Guishan often referred to himself as a buffalo. In response to Iron-grinder Liu's challenge, Guishan just lies down. He already has "a hundred battles' merit" and is "growing old in great peace." As far as that feast on Mount Tai is concerned, Guishan has been there and has done that, and furthermore, by lying down he is doing it right now. So as to her expression of the feast on Mount Tai, since Guishan did not want to fool around, Liu Tiemo had no option but to leave. If you totally identify with each moment, with each place, then you are space and time -- and won't be fooled by the words. According to an old saying, "The meaning is conveyed, but the words obstruct." Guishan just lies down. But how easy is it to do that? When your life and people, even those close to you, goad you, or criticize you, how easy is it to just let it go? We so desperately want to be right, that we have to defend ourselves, or assert ourselves, and make others wrong. Withdrawal is avoidance, but lying down is a most active expression of Guishan's state of mind. Guishan has been through hundreds of Dharma combats and only wants to grow old in peace. He doesn't even want to play with Liu. It's only young monks who talk about Buddha! Old generals don't tell war stories. Liu also lets go. She's like a bright jewel on the stand. When a foreigner appears, a foreigner is reflected; when a native appears, a native is relfected. Whatever appears, that's what's reflected. Tomorrow there's a feast on Mount Tai. How will you go? "Old cow." Liu Tiemo was perhaps forty or fifty years old then, but when Guishan says "old," he is looking directly at Liu's essential nature, which has neither beginning nor end -- no dualistic opposition, no subject or object, no coming or going, no movement whatsoever. So Guishan means to say, "Although there is no coming and going, have you come? ", trying to trip Iron Grindstone. Had she answered, "Yes, I've come," she would have failed, since this answer envisages only the phenomenal world. We have to savor the Zen ability of Iron-Grinder Liu, who answered by questioning "Will you go there?" although she knew quite well that there was no going or coming in the essential world. Guishan lay down and stretched himself out. It reminds me of the saying, "Void of traces, without tracks," which means that there is no communication whatsoever between the two parties. Even if you want to have a glimpse into Guishan's heart, you can't see anything – even the Buddha can see nothing there. He is totally dead, so to speak, showing no trace of "Zen" or "satori." He just lay down, as if to say, "I don't know what you are talking about, it has nothing to do with me." There is a saying by a poet of old: "Old and tottering, lazy and loafing, this man has nothing to do, /An idle one lies in a drowsy sleep, facing the blue mountains." Without having anything to do, you simply lie down for your afternoon nap – how nice to be like that! But what should you do after obtaining great leisure? If you just keep on taking a lazy nap, it will amount to nothing. Once you have realized a life without any delusions, you must work for other people arduously from morning till night. Iron Grindstone left immediately. Truly, there is nothing. As if to say, "So, you are like this? Then I have nothing to do here either." Please appreciate and savor this scene. The first exchange of words belongs to the phenomenal world: "You have come!" – "Will you go?" This is the dimension of "releasing," in contrast to "gathering," which is a sheer manifestation of the world of enlightenment or of nothingness. "Gathering and releasing" is the same as "taking and giving" or "killing and giving life." To lie down to show the world of nothingness is "gathering." To go away, insinuating, "I have nothing to do with this place," is also "gathering." We can also see the exchange as an interplay of "host and guest." When Guishan says, "Old cow, you have come!" he is the host, and Iron Grindstone the guest. When Liu asks, "Will you go? ", she is the host and Guishan the guest. When Guishan lies down and stretches himself, he is the host. When Liu goes away, she is the host. Host becomes guest, guest becomes host; these two change places quite freely. In Zen dialogue, once you give the host role to your partner, it's difficult to get it back. In this case, however, the interaction of the roles is excellent. A dog brings the white flag of peace. they call to each other, going and coming together. arrive to the place, relax, and lie down. This is time now for everything. treasure for the hungry ghosts. in a neighbor's back garden.